Liczba stron: 240 Jest to ujednolicona liczba stron, która ułatwi Ci porównanie długości książek. Każda strona Legimi to 200 słów. 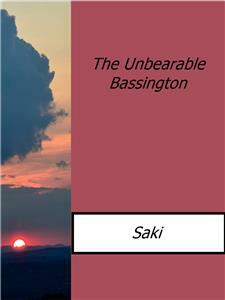 The Unbearable Bassington was the first novel written by Saki (H. H. Munro). It also contains much of the elegant wit found in his short stories. Comus Bassington, is a charming young man about town. His perversity however thwarts all his mother’s efforts to advance his prospects and lands him in hot water. Like many a “black sheep” he ends up being sent off to one of the colonies to fend for himself. Francesca Bassington sat in the drawing-room of her house in Blue Street, W., regaling herself and her estimable brother Henry with China tea and small cress sandwiches. The meal was of that elegant proportion which, while ministering sympathetically to the desires of the moment, is happily reminiscent of a satisfactory luncheon and blessedly expectant of an elaborate dinner to come. Her enemies, in their honester moments, would have admitted that she was svelte and knew how to dress, but they would have agreed with her friends in asserting that she had no soul. When one’s friends and enemies agree on any particular point they are usually wrong. Francesca herself, if pressed in an unguarded moment to describe her soul, would probably have described her drawing-room. Not that she would have considered that the one had stamped the impress of its character on the other, so that close scrutiny might reveal its outstanding features, and even suggest its hidden places, but because she might have dimly recognised that her drawing-room was her soul. Francesca was one of those women towards whom Fate appears to have the best intentions and never to carry them into practice. With the advantages put at her disposal she might have been expected to command a more than average share of feminine happiness. So many of the things that make for fretfulness, disappointment and discouragement in a woman’s life were removed from her path that she might well have been considered the fortunate Miss Greech, or later, lucky Francesca Bassington. And she was not of the perverse band of those who make a rock-garden of their souls by dragging into them all the stoney griefs and unclaimed troubles they can find lying around them. Francesca loved the smooth ways and pleasant places of life; she liked not merely to look on the bright side of things but to live there and stay there. And the fact that things had, at one time and another, gone badly with her and cheated her of some of her early illusions made her cling the closer to such good fortune as remained to her now that she seemed to have reached a calmer period of her life. To undiscriminating friends she appeared in the guise of a rather selfish woman, but it was merely the selfishness of one who had seen the happy and unhappy sides of life and wished to enjoy to the utmost what was left to her of the former. The vicissitudes of fortune had not soured her, but they had perhaps narrowed her in the sense of making her concentrate much of her sympathies on things that immediately pleased and amused her, or that recalled and perpetuated the pleasing and successful incidents of other days. And it was her drawing-room in particular that enshrined the memorials or tokens of past and present happiness. Into that comfortable quaint-shaped room of angles and bays and alcoves had sailed, as into a harbour, those precious personal possessions and trophies that had survived the buffetings and storms of a not very tranquil married life. Wherever her eyes might turn she saw the embodied results of her successes, economies, good luck, good management or good taste. The battle had more than once gone against her, but she had somehow always contrived to save her baggage train, and her complacent gaze could roam over object after object that represented the spoils of victory or the salvage of honourable defeat. The delicious bronze Fremiet on the mantelpiece had been the outcome of a Grand Prix sweepstake of many years ago; a group of Dresden figures of some considerable value had been bequeathed to her by a discreet admirer, who had added death to his other kindnesses; another group had been a self-bestowed present, purchased in blessed and unfading memory of a wonderful nine-days’ bridge winnings at a country-house party. There were old Persian and Bokharan rugs and Worcester tea-services of glowing colour, and little treasures of antique silver that each enshrined a history or a memory in addition to its own intrinsic value. It amused her at times to think of the bygone craftsmen and artificers who had hammered and wrought and woven in far distant countries and ages, to produce the wonderful and beautiful things that had come, one way and another, into her possession. Workers in the studios of medieval Italian towns and of later Paris, in the bazaars of Baghdad and of Central Asia, in old-time English workshops and German factories, in all manner of queer hidden corners where craft secrets were jealously guarded, nameless unremembered men and men whose names were world-renowned and deathless. And above all her other treasures, dominating in her estimation every other object that the room contained, was the great Van der Meulen that had come from her father’s home as part of her wedding dowry. It fitted exactly into the central wall panel above the narrow buhl cabinet, and filled exactly its right space in the composition and balance of the room. From wherever you sat it seemed to confront you as the dominating feature of its surroundings. There was a pleasing serenity about the great pompous battle scene with its solemn courtly warriors bestriding their heavily prancing steeds, grey or skewbald or dun, all gravely in earnest, and yet somehow conveying the impression that their campaigns were but vast serious picnics arranged in the grand manner. Francesca could not imagine the drawing-room without the crowning complement of the stately well-hung picture, just as she could not imagine herself in any other setting than this house in Blue Street with its crowded Pantheon of cherished household gods. And herein sprouted one of the thorns that obtruded through the rose-leaf damask of what might otherwise have been Francesca’s peace of mind. One’s happiness always lies in the future rather than in the past. With due deference to an esteemed lyrical authority one may safely say that a sorrow’s crown of sorrow is anticipating unhappier things. The house in Blue Street had been left to her by her old friend Sophie Chetrof, but only until such time as her niece Emmeline Chetrof should marry, when it was to pass to her as a wedding present. Emmeline was now seventeen and passably good-looking, and four or five years were all that could be safely allotted to the span of her continued spinsterhood. Beyond that period lay chaos, the wrenching asunder of Francesca from the sheltering habitation that had grown to be her soul. It is true that in imagination she had built herself a bridge across the chasm, a bridge of a single span. The bridge in question was her schoolboy son Comus, now being educated somewhere in the southern counties, or rather one should say the bridge consisted of the possibility of his eventual marriage with Emmeline, in which case Francesca saw herself still reigning, a trifle squeezed and incommoded perhaps, but still reigning in the house in Blue Street. The Van der Meulen would still catch its requisite afternoon light in its place of honour, the Fremiet and the Dresden and Old Worcester would continue undisturbed in their accustomed niches. Emmeline could have the Japanese snuggery, where Francesca sometimes drank her after-dinner coffee, as a separate drawing-room, where she could put her own things. The details of the bridge structure had all been carefully thought out. Only — it was an unfortunate circumstance that Comus should have been the span on which everything balanced. Francesca’s husband had insisted on giving the boy that strange Pagan name, and had not lived long enough to judge as to the appropriateness, or otherwise, of its significance. In seventeen years and some odd months Francesca had had ample opportunity for forming an opinion concerning her son’s characteristics. The spirit of mirthfulness which one associates with the name certainly ran riot in the boy, but it was a twisted wayward sort of mirth of which Francesca herself could seldom see the humorous side. In her brother Henry, who sat eating small cress sandwiches as solemnly as though they had been ordained in some immemorial Book of Observances, fate had been undisguisedly kind to her. He might so easily have married some pretty helpless little woman, and lived at Notting Hill Gate, and been the father of a long string of pale, clever useless children, who would have had birthdays and the sort of illnesses that one is expected to send grapes to, and who would have painted fatuous objects in a South Kensington manner as Christmas offerings to an aunt whose cubic space for lumber was limited. Instead of committing these unbrotherly actions, which are so frequent in family life that they might almost be called brotherly, Henry had married a woman who had both money and a sense of repose, and their one child had the brilliant virtue of never saying anything which even its parents could consider worth repeating. Then he had gone into Parliament, possibly with the idea of making his home life seem less dull; at any rate it redeemed his career from insignificance, for no man whose death can produce the item “another by-election” on the news posters can be wholly a nonentity. Henry, in short, who might have been an embarrassment and a handicap, had chosen rather to be a friend and counsellor, at times even an emergency bank balance; Francesca on her part, with the partiality which a clever and lazily-inclined woman often feels for a reliable fool, not only sought his counsel but frequently followed it. When convenient, moreover, she repaid his loans. Against this good service on the part of Fate in providing her with Henry for a brother, Francesca could well set the plaguy malice of the destiny that had given her Comus for a son. The boy was one of those untameable young lords of misrule that frolic and chafe themselves through nursery and preparatory and public-school days with the utmost allowance of storm and dust and dislocation and the least possible amount of collar-work, and come somehow with a laugh through a series of catastrophes that has reduced everyone else concerned to tears or Cassandra-like forebodings. Sometimes they sober down in after-life and become uninteresting, forgetting that they were ever lords of anything; sometimes Fate plays royally into their hands, and they do great things in a spacious manner, and are thanked by Parliaments and the Press and acclaimed by gala-day crowds. But in most cases their tragedy begins when they leave school and turn themselves loose in a world that has grown too civilised and too crowded and too empty to have any place for them. And they are very many. Henry Greech had made an end of biting small sandwiches, and settled down like a dust-storm refreshed, to discuss one of the fashionably prevalent topics of the moment, the prevention of destitution. Francesca made some monosyllabic response, a sort of sympathetic grunt which was meant to indicate that she was, to a certain extent, listening and appreciating. In reality she was reflecting that Henry possibly found it difficult to interest people in any topic that he enlarged on. His talents lay so thoroughly in the direction of being uninteresting, that even as an eye-witness of the massacre of St. Bartholomew he would probably have infused a flavour of boredom into his descriptions of the event. Francesca went over immediately but decorously to the majority that will not stop to consider. In the propagandist movements of Sociology, as in other arenas of life and struggle, the fiercest competition and rivalry is frequently to be found between closely allied types and species. Eliza Barnet shared many of Henry Greech’s political and social views, but she also shared his fondness for pointing things out at some length; there had been occasions when she had extensively occupied the strictly limited span allotted to the platform oratory of a group of speakers of whom Henry Greech had been an impatient unit. He might see eye to eye with her on the leading questions of the day, but he persistently wore mental blinkers as far as her estimable qualities were concerned, and the mention of her name was a skilful lure drawn across the trail of his discourse; if Francesca had to listen to his eloquence on any subject she much preferred that it should be a disparagement of Eliza Barnet rather than the prevention of destitution. Francesca laughed with genuine amusement. “I suppose she is really wonderfully well up in all the subjects she talks about,” was her provocative comment. Henry grew possibly conscious of the fact that he was being drawn out on the subject of Eliza Barnet, and he presently turned on to a more personal topic. “From the general air of tranquillity about the house I presume Comus has gone back to Thaleby,” he observed. Francesca closed her eyes with the air of one who seeks to shut out a distressing vision. She was not fond of looking intimately at the future in the presence of another person, especially when the future was draped in doubtfully auspicious colours. “And then what?” persisted Henry. “He must do something,” said Francesca. Henry, who never killed anything larger or fiercer than a trout, was scornfully superior on the subject of big game shooting. Comus was not a favourite with his uncle. Francesca had turned to her writing cabinet and was hastily scribbling a letter to her son in which the delicate health, timid disposition and other inevitable attributes of the new boy were brought to his notice, and commanded to his care. When she had sealed and stamped the envelope Henry uttered a belated caution. Francesca did know, and already was more than half of her brother’s opinion; but the woman who can sacrifice a clean unspoiled penny stamp is probably yet unborn. Lancelot Chetrof stood at the end of a long bare passage, restlessly consulting his watch and fervently wishing himself half an hour older with a certain painful experience already registered in the past; unfortunately it still belonged to the future, and what was still more horrible, to the immediate future. Like many boys new to a school he had cultivated an unhealthy passion for obeying rules and requirements, and his zeal in this direction had proved his undoing. In his hurry to be doing two or three estimable things at once he had omitted to study the notice-board in more than a perfunctory fashion and had thereby missed a football practice specially ordained for newly-joined boys. His fellow juniors of a term’s longer standing had graphically enlightened him as to the inevitable consequences of his lapse; the dread which attaches to the unknown was, at any rate, deleted from his approaching doom, though at the moment he felt scarcely grateful for the knowledge placed at his disposal with such lavish solicitude. “You’ll get six of the very best, over the back of a chair,” said one. “They’ll draw a chalk line across you, of course you know,” said another. Lancelot tried to nourish a wan hope that there might be an element of exaggeration in this uncomfortably realistic description. Meanwhile in the prefects’ room at the other end of the passage, Comus Bassington and a fellow prefect sat also waiting on time, but in a mood of far more pleasurable expectancy. Comus was one of the most junior of the prefect caste, but by no means the least well-known, and outside the masters’ common-room he enjoyed a certain fitful popularity, or at any rate admiration. At football he was too erratic to be a really brilliant player, but he tackled as if the act of bringing his man headlong to the ground was in itself a sensuous pleasure, and his weird swear-words whenever he got hurt were eagerly treasured by those who were fortunate enough to hear them. At athletics in general he was a showy performer, and although new to the functions of a prefect he had already established a reputation as an effective and artistic caner. In appearance he exactly fitted his fanciful Pagan name. His large green-grey eyes seemed for ever asparkle with goblin mischief and the joy of revelry, and the curved lips might have been those of some wickedly-laughing faun; one almost expected to see embryo horns fretting the smoothness of his sleek dark hair. The chin was firm, but one looked in vain for a redeeming touch of ill-temper in the handsome, half-mocking, half-petulant face. With a strain of sourness in him Comus might have been leavened into something creative and masterful; fate had fashioned him with a certain whimsical charm, and left him all unequipped for the greater purposes of life. Perhaps no one would have called him a lovable character, but in many respects he was adorable; in all respects he was certainly damned. Rutley, his companion of the moment, sat watching him and wondering, from the depths of a very ordinary brain, whether he liked or hated him; it was easy to do either. “It’s not really your turn to cane,” he said. The droll lightheartedness which won Comus Bassington such measure of popularity as he enjoyed among his fellows did not materially help to endear him to the succession of masters with whom he came in contact during the course of his schooldays. He amused and interested such of them as had the saving grace of humour at their disposal, but if they sighed when he passed from their immediate responsibility it was a sigh of relief rather than of regret. The more enlightened and experienced of them realised that he was something outside the scope of the things that they were called upon to deal with. A man who has been trained to cope with storms, to foresee their coming, and to minimise their consequences, may be pardoned if he feels a certain reluctance to measure himself against a tornado. Men of more limited outlook and with a correspondingly larger belief in their own powers were ready to tackle the tornado had time permitted. “I think I could tame young Bassington if I had your opportunities,” a form-master once remarked to a colleague whose House had the embarrassing distinction of numbering Comus among its inmates. “Heaven forbid that I should try,” replied the housemaster. “But why?” asked the reformer. “Now you are talking in the language of Peter Pan,” said the form-master. And he went his way, having maintained a form-master’s inalienable privilege of being in the right. In the prefects’ room, Comus busied himself with the exact position of a chair planted out in the middle of the floor. “I think everything’s ready,” he said. Rutley glanced at the clock with the air of a Roman elegant in the Circus, languidly awaiting the introduction of an expected Christian to an expectant tiger. “The kid is due in two minutes,” he said. “He’d jolly well better not be late,” said Comus. Comus had gone through the mill of many scorching castigations in his earlier school days, and was able to appreciate to the last ounce the panic that must be now possessing his foredoomed victim, probably at this moment hovering miserably outside the door. After all, that was part of the fun of the thing, and most things have their amusing side if one knows where to look for it. “Six,” said Comus briefly, picking up his cane. “I didn’t see the notice on the board,” hazarded Lancelot as a forlorn hope. And Comus indicated the chair that stood in sinister isolation in the middle of the room. Never had an article of furniture seemed more hateful in Lancelot’s eyes. Comus could well remember the time when a chair stuck in the middle of a room had seemed to him the most horrible of manufactured things. “Lend me a piece of chalk,” he said to his brother prefect. Lancelot ruefully recognised the truth of the chalk-line story. Comus drew the desired line with an anxious exactitude which he would have scorned to apply to a diagram of Euclid or a map of the Russo–Persian frontier. There was a carefully measured pause, and then Lancelot was made vividly aware of what a good cane can be made to do in really efficient hands. At the second cut he projected himself hurriedly off the chair. Lancelot got back on to the chair, and was rearranged to the taste of his executioner. He stayed there somehow or other while Comus made eight accurate and agonisingly effective shots at the chalk line.